Kelly beats Kobach, promises she’ll ditch partisan ways as governor – Welcome to Wyandotte Daily! He lost to a 68-year-old state senator from Topeka who ran as a moderate, banking on a reputation in the Legislature as someone willing to find compromise rather than as a charismatic force for change. Instead, Kelly called for Kansas to roll back the clock a decade to when previous Democratic governors formed coalition governments by cobbling together support from party regulars and Republicans uncomfortable with its far-right factions. Kobach represented the most aggressive version of that conservative wing. Kelly pledged to restore school spending and move past the tax-cutting, service-slicing ways of former Gov. Sam Brownback’s time in the office. To win the overwhelmingly Republican state, she walked a delicate line of appealing to moderate GOP voters while trying to enthuse bleed-blue Democrats. She also championed the endorsements of several high-profile Republicans from an earlier era of Kansas politics. 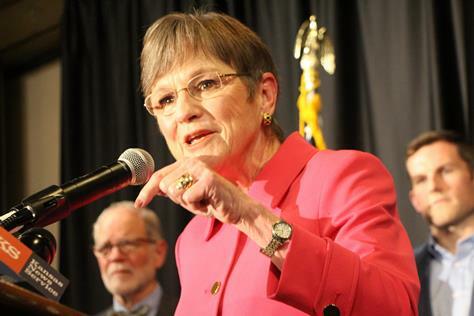 Her campaign focused time and again on Brownback, arguing to voters that Kobach would return the state to the policies that carved away tax revenue and triggered cuts in a range of services. In her victory speech, she congratulated Kobach and independent Greg Orman on their campaigns. An otherwise raucous crowd went quiet. Kobach spoke to supporters briefly, mostly thanking his family and campaign staff for weathering the grind of the campaign. He said his loss resulted from political forces pushing against Republicans in the midterm election. “Headwinds all the way,” Kobach said. He said Kelly had too much money. Much of Kobach’s campaign was financed by running mate Wink Hartman whereas Kelly relied more on smaller donors. Other spending in the campaign came from independent groups, notably the Republican Governors Association. Still, Kobach insisted Tuesday night that he couldn’t keep up in the money and advertising parts of the campaign. Orman, who made a close run for the U.S. Senate four years ago, turned out not to be a factor in the race. Kelly supporters had pressured him to drop out, fearing he would capture the votes of moderate Republicans who would otherwise opt for the Democrat. In the end, Orman pulled about 6 percent of the vote. Kobach would have needed nearly every one of those votes to overcome Kelly. At the most, Orman’s candidacy might have denied her a clear majority — not of the plurality that swept her into office. In other statewide races, Republicans maintained their grip on races farther down the ballot. In the race for secretary of state, State Rep. Scott Schwab beat former Google executive Brian McClendon. Attorney General Derek Schmidt bested a candidate the Democratic Party had abandoned. Vicki Schmidt ran away with the insurance commissioner’s race. Jake LaTurner will remain treasurer. When Kelly begins her term in January, it will be the first time since 2011 that Republicans haven’t controlled the governor’s office, the Kansas House and the Kansas Senate. Kelly’s election revives the prospect that Kansas could expand Medicaid coverage. After moderates made sweeping wins in the 2016 election, the Legislature voted for the expansion in 2017 but failed to overcome a veto by then-Gov. Sam Brownback. Kelly has made clear her support for Medicaid expansion, which represents an embrace of the Affordable Care Act, commonly known as Obamacare. Lawmakers might now rally behind expansion. Her victory likely will mean an end to tax cuts, and the possibility of tax increases to pay for greater state aid to local school districts and an array of social programs. Those were virtually impossible under Brownback and his successor, Jeff Colyer. Young supporters at Kelly’s Topeka election party said they were inspired by her positions on immigration and education — issues where she differed sharply from Kobach. “She’s not as hateful as Kobach when it comes to, well, mostly everything,” Shimel said. In 2014, fewer than 870,000 people voted in the governor’s race and Brownback beat Democrat Paul Davis by about 3.5 percentage points — despite a steady string of polls suggesting Davis was leading in the days running up to the actual voting. This year, more than 1 million Kansans voted in the governor’s race. Kelly got about 48 percent, Kobach 43 percent and Orman roughly 6 percent. The election returns showed a split in Kansas mirroring that in the country. In places where people live close together — the Kansas City suburbs, Wichita, Topeka, college towns — the Democrats won. Where they live far apart, the Republicans piled up votes. Even as statistically sound polls continued to suggest Orman was doomed to fall far behind the main contenders, he stayed in the race. His campaign treasurer quit a week before the election and endorsed Kelly, saying Orman had promised to drop out of the race if his stock hadn’t risen beyond spoiler status a month before the election. Some supporters remained convinced even early Tuesday evening that Orman could pull off a shocker. Sean Reilly, a retired school teacher, hung his hopes on an unscientific poll of self-selected voters that suggested he might win with a plurality just shy of 40 percent. And, it turned out, they weren’t representative of the electorate. In the end, he may have denied Kelly a clear majority but not a win. Orman promised to advocate for those independents who voted for him and challenged the coming Kelly administration to avoid partisanship. In the secretary of state’s race, conservative state Rep. Scott Schwab continued Republicans’ hold on the office by beating out former Google executive Brian McClendon. While one Democrat was appointed to briefly serve in the office in recent years, only Republicans have won election to the post since the middle of the 20th century. Kobach elevated the job’s profile, using the force of his personality and headline-grabbing claims about immigration and claims of widespread voter fraud to catapult himself to national prominence as a Fox News regular and a sometimes-confidant to President Trump. Schwab promised voters a less controversial tenure, although he’d been a key player in the Legislature backing Kobach’s wide-ranging efforts. Schwab said he at least wouldn’t oppose efforts to strip the secretary of state of one-of-a-kind powers to directly prosecute voter fraud cases granted during the Kobach years. McClendon promised an aggressive re-make of the office aimed at making voting easier and using his Silicon Valley know-how to tailor the job’s record-keeping chores to business needs. Schwab pledged Tuesday night to help county clerks navigate Kansas statutes and avoid conflicts with the American Civil Liberties Union, which was often at odds — and campaigned against — Kobach. “We’re gonna make sure you get the understanding of what the legislature wanted so you will be able to execute on elections in a way that you don’t have to worry about the ACLU trying to kick down your door anymore,” Schwab said. Madeline Fox, Nomin Ujiyediin, Brian Grimmett and Amy Jeffries contributed to this report.